SYC always welcomes new members and you don’t necessarily need to already have - or even buy - your own boat. For more experienced sailors, the club maintains a small, varied fleet of dinghies that can be hired by members at very reasonable rates. For those perhaps a little less experienced or if you enjoy the role of tactician, crews for double-handed dinghies are always in demand. Experience is useful of course but is by no means essential, as existing members are always happy to train up new crews. Please do make contact - we’d love to welcome you to our friendly club. Read more: New Members Always Welcome! 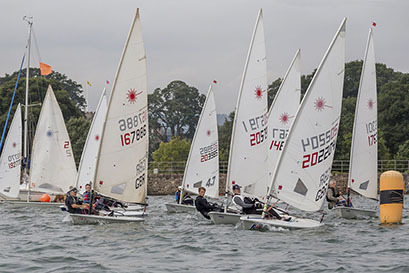 The sailing programme for 2019 has now been uploaded to the website. Please click here to see the programme or here to download an .ics file for Outlook, etc. Please note that although the programme is unlikely to change, people should always double check the website prior to attending an event. Duties are also liable to change due to people using the DutyMan swap system. A printable pdf version of the programme is available here . 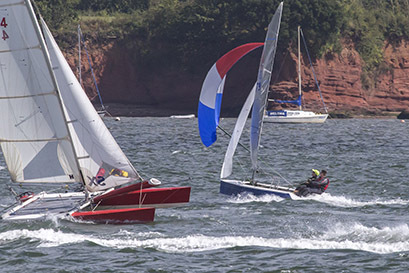 Starcross Yacht Club has signed up to the RYA Green Blue scheme which encourages water sport clubs to protect their environment and therefore enjoy more their chosen water sport area. Eight years ago SYC, partially funded by the RYA, installed a rainwater harvesting unit which stores 3000 litres of rain water runoff from the boat shed roof and feeds it through UV germicidal filters to the flushing toilets. Last year 29 cubic metres of rainwater was supplied to the toilets. During the galley refurbishment, water heating controllers were installed which provide hot water when required during galley service and then shut down, reducing power wastage. Investigating other potential energy saving possibilities, we identified the oil-fired changing room heating as a suitable candidate. Previously it has operated 3 times a day on a 7 day time clock, consuming approximately 32 litres a week and providing hit-and-miss heating for Sunday winter racing. As of now the changing room heating is operated on a demand-only basis. 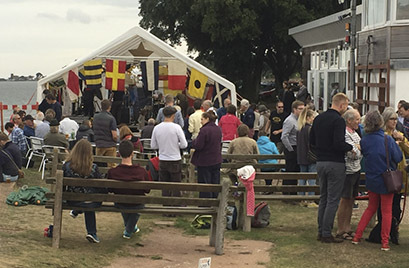 What a great day we had for this year's Laser open meeting, held on 1st September: grey skies clearing to beautiful blue, with a wind, force 2-3, blowing almost straight up the estuary from the south-southeast, and wonderfully warm. The tide was rising towards its peak as the first race got under way, but was well and truly ebbing by the end of the final race. Starstock 2 was bigger (and drier) than last year’s event. No rain, more music and a bigger crowd but otherwise a formula that seemed to keep 250 members and guests pretty happy from 4pm until 11pm. Easily forgotten as you hoist the main for a jaunt to the Exmouth beach café or an afternoon's downriver spinnaker practice with your crew - but did you sign out on the Day Sailing log? The log is located above the seat in the Committee Room porch just to the left of the Boat Shed, and the Club would like to remind all members going out for a leisure sail to sign out on departure and back in on return. The majority of leisure sailors do observe this formality, but if it slips your mind occasionally, or seems an irritating extra, may we ask you to add it now to your launching countdown? It's in your own interest to remember, in two ways. Firstly safety - if you should experience a major mishap, the details in the sailing log will give a person discovering your empty launching trolley at dusk some chance of providing useful information to the emergency services. Please in all cases sign in on your return to say you are safely back. 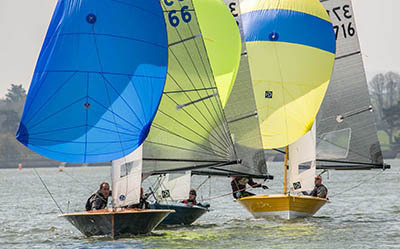 Starcross Yacht Club was host to home and visiting Merlin Rocket sailors on the weekend of the 21/22 April, 2018 with a total of 26 boats entering. Mixed weather with light winds on Saturday and Sunday meant there was close racing throughout. Thanks to all the members who worked behind the scenes to make this happen, and especially to the galley team for their excellent catering. Our thanks to Garnett Showell for an excellent album of on-the-water photographs of this event. RYA Green Blue - SYC now joined up! SYC will be more 'green' and eco-friendly, in part, helping to ensure our 'blue' on which we love to spend our leisure time is cared for, pollution-free and healthy for us and wildlife. Did you know we already recycle our rainwater? Now our first official 'Green-Blue' initiative is to tackle single-use plastic. Already the Juniors have moved away from polystyrene chip trays and have had a huge clean-up at the club this Saturday. Hundreds of pieces of micro-plastic and lots of plastic litter in hedges and under boats were cleared. Please do your bit to help keep our club eco-friendly and plastic-free, and if you are interested in the project please email Ali on alisonmcgregr@ hotmail.com. Liz and Aidan – the Last of the Mohicans!